Fresh meat coming through. 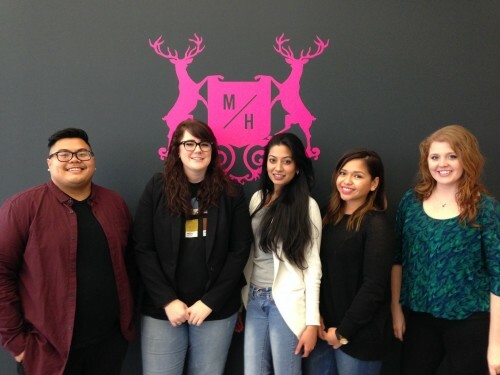 MUH-TAY-ZIK | HOF-FER is excited to welcome five new interns to the team. Greggy Adriano is from Daly City and is currently a student at The Art Institute. Something you might not know about Greggy is that he is super obsessed with notebooks. Who doesn’t love a good notebook? Also, Greggy has played the ukulele since he was 22 (video of the office concert to come). Hollye Westbrook hails from a Kentucky dairy farm and has a degree in graphic design from Western Kentucky University. She loves to draw and is a big music fan. She moved to SF a year ago and is currently a student at Miami Ad School. Mishal Jagjivan is from South Africa and has a bomb accent. For undergrad, she was a screenwriting and film studies major at the University of Witwaterstrand in South Africa (Cool me too). Currently, she is a student at Miami Ad School. She is an avid filmgoer and particularly enjoys horror movies—but not the critically acclaimed ones, the cheap thrillers. Jennifer Garcia is from Union City, CA and graduated from Santa Clara University. Following Santa Clara she moved around as a marketing specialist for several tech startups. She then decided to enroll at Miami Ad School to add some creativity to her life. When asked her favorite hobbies she said she was a big fan of stand up and she loved salmon sashimi. No further questions. Oh, but she also likes to act and write screenplays. Kaitlyn Moseley is from Texas, and went to Miami Ad School in Miami, FL. She just returned to the U.S. after a three-month stint in Europe where she was interning with Ogilvy in Paris. Of the 8 countries she visited abroad, Dublin came out on top on the favorites list. Cheers. Kaitlyn loves to cook and also enjoys a good craft making sesh.